For many cannabis growers, the name Skunk stands for simplicity and reliability and for some it simply means some “darn good weed”, so darn good that Skunk has become one of the most known cannabis strains ever soon after her introduction to the scene back in the 1970s. Cannabis lore tells us that the original Skunk incorporates a diverse range of genetics, including Afghani, Mexican and Columbian. Out came a remarkable indica/sativa hybrid that literally wrote Cannabis history. It is her trademark reliable genetics that makes growing Skunk super easy, even for growers who don’t have a lot of experience. But not only is Skunk easy to grow, she does it without any compromises and in fact, brings some crazy yields of up to 600g/m² to the table when you grow her indoors. Her average height of only 80-110cm indoors is another plus which makes her an ideal plant for most types of growing locations. Outdoors, Skunk can grow to a height of 150-200cm where she can impress with yields of up to 650g per plant. This crazy productivity in a very short 55 days of flowering, makes Skunk also a superb choice for cash croppers or anyone who wants to see reliable results in record time without any growing hassles. While growing Skunk can be a pleasure on its own, it obviously wouldn’t make much sense if that’d be all there is to this legendary classic. Of course, this is not the case. Once you harvested and cured her super-dank bud, Skunk shows off her unique trademark aroma which is a wonderful blend of sweet and spicy notes with the distinctive “Skunk” flavour on top of it, making her a top choice still today for many cannabis enthusiasts. With 17% of THC, she delivers a strong, yet not too strong effect that is wonderfully balanced though, mixing a pleasant and uplifting euphoria with awesomely deep relaxation. Skunk is a true legend. Books could be (and likely have been) written about her and the reasons why you can’t go wrong growing this remarkable cannabis strain. Our Zambeza Skunk variant stands out among the many others available and sure won’t disappoint with her excellent yields, great taste and high. A fantastic strain to grow, suitable for seasoned cannabis cultivars and beginners! 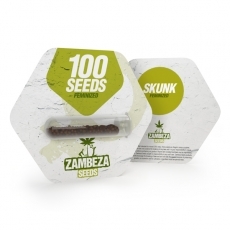 With Zambeza Skunk bulk seeds in packages of 100 seeds, you can stock up on some of the finest Skunk seeds available today.